Almost 10 years ago, when I was a child-free, single-chinned (bah) newlywed and this site was 6 weeks old, I passingly mentioned making the Belgian brownies they serve at Le Pain Quotidien. They were as delicious as should be expected from something that’s nothing but chocolate, butter, sugar, eggs and a smidge of flour. However, I never made them after that because, ever the pedant, to me they weren’t real brownies. Brownies are dense, fudgy and even a little chewy and these were featherlight and rich. I don’t know what’s wrong with me either. These might have stayed in the substratum of the archives forever had my husband’s attempts to save me from hospital food after the arrival of this butterfly last summer included regular deliveries of Cobb salads and the aforementioned Belgian brownie at the LPQ by the hospital. I actually said “Oh, that brownie is never as good as it seems like it’s going to be” before taking a bite of what was the best thing I have ever eaten in my whole life, or at least in 40 weeks of everything tasting decidedly mediocre. Those brownies, which I’d keep in the fridge and cut little wedges from all hours of the day and night over the next couple days, were everything. I vowed to refresh them here and give them the adoration they were overdue. Things got a little busy after that, as you can imagine, but these were worth every second of the wait. 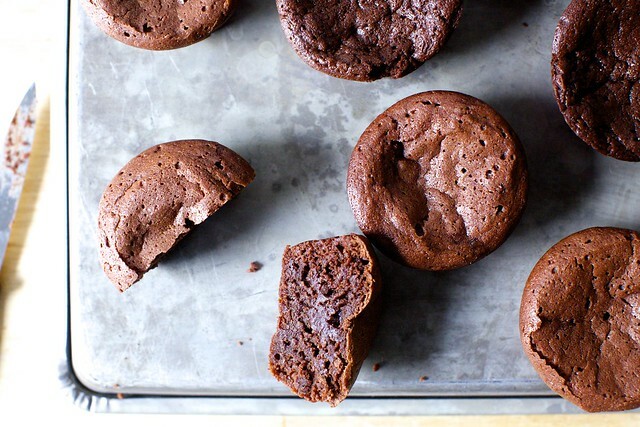 Shaken free from the narrow confines of a classic brownie, these are so much more — halfway to molten inside with a shattery lid. When they’re unmolded onto a plate or cooling rack, they sigh and dent a little, as if they had to shift their weight onto one hip after standing too long on too weak a foundation. Their shoulders appear cushiony. They look like humble little shrugs of chocolate and require no adornment, but taste like stars. Yield: 12 in a standard-size (1/2 cup) cupcake mold. I poured some of the batter into these fluted mini-tartlet pans that I never use otherwise; they’re slightly smaller (despite looking bigger) so you’ll end up with 14. They look cute, but I prefer the cushiony texture that came from the cupcake-shaped ones, so don’t run out and buy them for this. I made several small adjustments to the recipe. The original recipe yields a persnickety 14, calls for superfine sugar and pastry flour; my adjusted recipe makes an even dozen with the ingredients you already have around, plus some much-needed salt. It’s also all mixed by hand in one bowl in under 5 minutes. I made one round with cocoa powder instead of flour, because, you know, gluten. While I would never not eat them, I was sad to find that they lost their shiny lid, which was less crisp too. Do know that the swap works, but if flour isn’t an issue for you, please keep it in there. I also made a batch with 2 tablespoons less sugar and we found them more enjoyably bittersweet; feel free to do the same if that’s your preference. These contain an unconscionable amount of butter and we shouldn’t question it; this isn’t the time for it. Someone is going to ask me if they can frost these. You may not. These are such a perfect self-contained luxury, save the frosting for some arid sheet cake that needs it. If you serve it with anything, my suggestion would be a dollop of barely sweetened whipped cream, a dusting of powdered sugar and/or some berries. 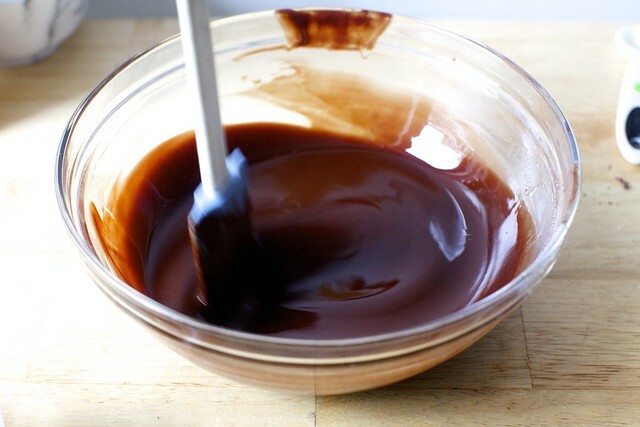 Place chocolate and butter in a large heatproof bowl. Either over a saucepan of simmering water or in the microwave in 15- to 30-second bursts, stirring frequently, melt the two together. Off the heat, whisk in sugar, which should cool the mixture down significantly. Whisk in salt, then eggs, one at a time. Stir in flour. Let cool on a rack for 5 to 10 minutes before unmolding. Puffed tops will fall a little as they cool. Oooh, one of my favorite desserts, brownies. I usually add chocolate chips to mine. Do you think that would work in this recipe? I like the texture they provide and the flavor. 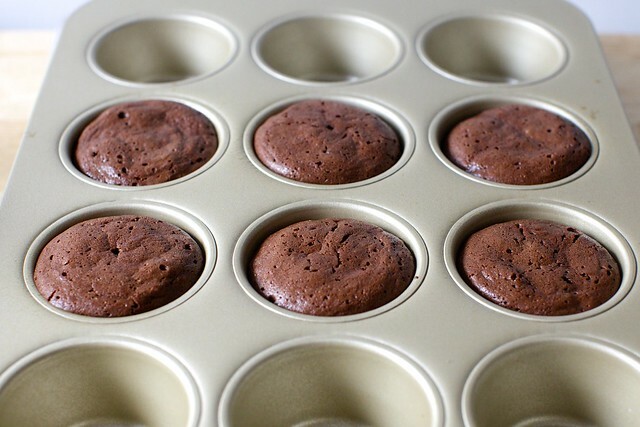 This may be silly….but do you think mini-muffin pan would work to make brownie bites? I don’t want to lose the top texture you describe. These are the key to my dang heart! So pretty and chewy looking! These are secretly perfect for Valentine’s Day! Hope this isn’t blasphemy, but these look like they might be similar to the addictively-textured little Trader Joe’s brownie bites. Can’t wait to try! Jane — Definitely you can halve them, though easier with a scale. Katie — Absolutely. I’ve made them in mini-muffin tins. Shannon — I wouldn’t; there’s enough going on here that it’s not needed. Can’t believe I’m one of the first commenters! I right away compared these with one of my favourite European-style (ie, barely any flour) brownie recipes, David Lebovitz’s gluten-free brownies on his site, because at first they seemed very similar. But his recipe has a ratio of 1:2 for butter:flour…and this recipe obviously does not! I will be giving it a try *for sure*. BTW, David’s recipe is gluten-free as he uses 3 tbsp of cornstarch (with vigorous stirring) instead of flour (there are also only 2 eggs in the recipe for a similar amount of chocolate and sugar)…so that might work here too. Oh Deb, I love you. I’ve been out of range of a Le Pain Quotidien since leaving my last job in SoHo and they’ve thus been out of mind. But I love these brownies. They’re so simple but so special. Thank you for the recipe! These look amazing, but even more than that, they sound amazing. Your description of these little cakes sold me. *I meant a 1:2 ratio for butter:chocolate, not flour! Serious question though, how do you deal with your daughter being like that? Her adorableness is quite a problem for me. For real. That red hair! Those eyebrows! She’s so stinkin’ cute I now suddenly want to have a baby! Also: these brownies are almost exactly the same as a chocolate cake I found on Orangette years ago and that has since beome my standby. So easy to make, such a showstopper. Hers uses a little more sugar (although I scale it down to about the same amount you’re using to adjust for European palates), one more egg and only one tablespoon of flour. It’s absolutely amazing! These look incredible, and your recipe intro made me laugh out loud (and was as helpful as ever). Frosting is for wimps, but do pass me barely sweetened whipped cream all day long. If one were to desperately need these… like, NOW, but only had semi-sweet chocolate chips, would reducing the sugar to compensate totally ruin the texture? Considering I made your beer chocolate cupcakes last weekend with a local brew (brewed with raspberry and cacao nibs, holy crap) and they were a HUGE hit at our Super Bowl party, and our Valentine’s plans include making your Fake Shack burger and oven fries while mourning the fact that we no longer live in New York and can’t go grab one whenever we want, I think these will help soak up our tears nicely. I love your site, have made and enjoyed several things – including your penne alla vodka for my now husband! – and am counting calories to help lose some weight gained last year (I know! the worst and also the best!). I don’t know that I can resist these, so I entered them in my calorie tracker. If this helps anyone reading, one brownie is 315. Not low calorie, but definitely not too crazy extravagant and a perfect little treat. Now, to try to make 12 but only eat 1 . . . .
Jessica, Katie, re: semisweet chocolate only — Use the 2T less sugar then. It might have a little less chocolate oomph, but I doubt anyone will turn it away. Lily — I don’t. I can’t. I’m buying pink stuff. We call her bunny. She’s killing us. Are these meant to be served warm, or do they work at room temperature? Like, say if a person was crazy enough to take these to school and feed the law students? Just a hypothetical. oh, these look amazing! And for once, I actually have everything on hand. Question for you: do you think they would freeze well? I’m currently trying to be less of a fatass/more of an adult and though having a dozen of these on hand SEEMS like a good idea, it’s really not. What do you think? Deb, have you ever considered taking up writing for a profession? I am saying this because I just read this paragraph “Things got a little busy after that, as you can imagine, but these were worth every second of the wait. Shaken free from the narrow confines of a classic brownie, these are so much more — halfway to molten inside with a shattery lid. When they’re unmolded onto a plate or cooling rack, they sigh and dent a little, as if they had to shift their weight onto one hip after standing too long on too weak a foundation. Their shoulders appear cushiony. They look like humble little shrugs of chocolate and require no adornment, but taste like stars.” And I cannot imagine such a description of a brownie, humble or not, LPQ standard or not. First time commenter here because this dragged me out of my invisibility cloak that I have kept on since very many years. Kudos to you and my very best to everyone in your adorable family! I wish I had an oven where I could bake these. Maybe I will give it a try with my mw-convection oven. :) Much love! Do you think this will work with unsweetened baking chocolate? I don’t want to be too sweet, and there is a block of unsweetened baking chocolate I need to use anyway. Kris — I think they’re great at room temperature, warm (although warm chocolate is less my thing because I’m a total weirdo) or cold. Lucky law students! ro — I think they’d freeze just fine. Some of the nuance of the crisp lid will be lost when defrosted, but nobody is going to be the wiser. Another Deb — Thank you. Sasha — I almost always go there in testing (prefer it) but didn’t this time. If you use it, I’d start with 1 1/4 to 1 1/3 cups sugar. When you baked them in the mini-muffin pan, was the baking time similar to your mini-tartlets (about 20 minutes) or was it less? I can’t tell from the pictures if the mini-tartlets are larger than mini-muffins. Thanks. Also, as a red-head myself, your sweet cupcake is adorable in pink, but wait until you get her in the jewel tones of kelly green, royal blue and royal purple. You will go into sweetness overload. Be prepared! These look so yummy! I need these in my life! Deb, what do you think of adding a nut meal instead of flour: like ground hazelnuts or almonds? Would that result in a “lid”? Would it pass on the flavor? Or would we need to add a bit of an extract/liqueur? Just throwing around an idea so some glute-free folks can still enjoy. Your munchkin is so adorable! Here’s hoping the red curls stick around because they’re stunning (when I was a baby, I had very fine blond straight hair. I now have amazingly curly brown hair. Go figure). Quick question about a mini-muffin tin. How much batter would you put into each cup? Fill it up? I’d definitely top these with some homemade whipped cream and raspberries! OK, now these will haunt me until I make them! Those look sooo delicious, I must make them. I must! Your description of these brownies are incredible. I don’t even have to look at the pictures to drool. These look to die for!! yummy yummy!! The image of brownies shifting hips is why you are my favorite food writer. Absolutely perfect. I had these a few years ago for the first time at LPQ and had to track down the recipe to make at home. I made it a few times at home back then – thoroughly enjoying the fudgy goodness – and then stopped. Haven’t had it in a long time. Thanks for the reminder and the simplified recipe! Ah, halfway to molten is everything! Was beauties! I love that we’ve been forbidden to frost. Thank you for sharing #theworst brownie recipe! I just arrive in america, what type of Chocolate you take for pastries? Have you got maybe a picture of the product? Do you think these would work in 9 oz ramekins? My yield would be lower, but I’m wondering if they would stick terribly. I guess I could serve them in the ramekins with whipped cream on top? Wow these do look amazing. Plus I’m Belgian so I really need to try these! I used to live in Brussels and ate these way too often (I also loved their croissants and their boeuf-basilic sandwich). They called them fondant au chocolat–basically molten chocolate. A typically franco-belgian dessert, served warm, never frosted. BTW, I’ve been making your oatmeal bread for my daughter’s breakfast–it’s a winner with chèvre. I love those little tartlet pans! But I appreciate you saying they come out better in the cupcake pan. FYI, in using the search function on your site, an ad takes over the whole results page and you cannot click through to the recipes. :***( ethereally smooth hummus! I need you! Deb, I love your commentary in the recipe notes: “These contain an unconscionable amount of butter and we shouldn’t question it; this isn’t the time for it. Someone is going to ask me if they can frost these. You may not.”Makes me glad I read it all the way through! Oh wow I can’t believe you’ve had your blog for 10 years, that’s mad! These look delicious and so easy to make, I’ll have to give them a go soon. I adore your perfect unapologetic use of butter in a sad-health-food-dominated world, but are the gooey insides a salmonella issue with the eggs? I love this idea! Bitesize brownies are a total weakness of mine so I have no doubt these would disappear relatively quickly… I sometimes think I prefer flourless brownies as they are just so much fudgeier – my favourite. Seriously, I read all your blog post, recipes and notes because of sentences like this, even if it’s something I’m never going to make. And for the kids’ pictures, of course! Love the first photo of the brownies; very nostalgic. Strangely, your description of this brownie made me think of my transition to motherhood. Once trim and poised, I too have shifted. I wake up 2-5 times a night, my hair is somehow simultaneously flat and frizzy, I am cushiony, unadorned, and so good. Thanks for the hard work and great writing. I plan on completing these for Valentines Day. Add a few roses and a good dessert wine and I’m a hero. Sometime I think my wife loves the fact that I clean up after myself more than any other attention. It doesn’t to try though. This is b-e-a-u-t-I-f-u-l and looks so delicious! I cannot wait to try! I’ve followed Smitten Kitchen for years and I’ve never commented before, but I just wanted to say that I adore your writing. A lot of the blogs that have exploded recently are seriously lacking in the writing department, but you have such a distinct voice – polished but approachable, a little whimsical/silly/self-deprecating but still authoritative – and I’ve never appreciated it more than now. “Humble little shrugs of chocolate” is one of the best lines I’ve ever read. Keep it up!! Your excellent work is so loved. (Also, these look amazing). I love how they look with the sunken middle…definitely something to make for the weekend! Thanks Deb! Since these have only 20 grams of flour do you think you can substitute 20 grams of Matzo Cake Meal and make them kosher for Passover? Thank you! You’re darling little brownie-ish creations are fixing to scratch my chocolate itch. Also – please add me to those who swooned over the humble shrugs paragraph. Inspired and l-o-v-e-l-y. Re, matzo meal, gluten-free flours, etc. — I mention in the headnotes that I tried this with cocoa powder instead of flour to see how it worked gluten-free and found the texture not as great, but certainly not a bad cake in any way… more details up top. Yona — The insides aren’t gooey; this isn’t a molten cake — the centers are set. They’re just soft because there’s a lot of egg and butter here, and little flour. Would you say these are similar to Valerie’s French Chocolate Cake? Not only do these sound delicious, I love how simple they are. I have no doubt I’ll make them very soon. Have you ever tried Alice Medrich’s method of melting chocolate in a stainless bowl set directly in a wide skillet of simmering water? Changed my life. This post strangely pulled me out of lurker status. Strange because we made your chili over the weekend, and I consult your cake file every time one of my kiddos has a birthday. This recipe will be my first bit of for-fun baking (tonight!) since my own summer baby. Thank you for that and for all your wonderful writing. Oh Deb – your writing sometimes makes me swoon as much as your recipes! Hi :) I have read your blog for a little while now and i have to say that your writing is the most hardest to read and understand! I don’t speak english in my everyday life(as you can propably notice from(of?) my grammar). I read the news and sometimes books in english without a dictionary but something in your beautiful writing makes it hard to understand. I found it very fascinating and enjoy reading it even though i have to reread some sentences a couple of times hahah! These look delicious and you described them is such a whimsical manner… and your little bunny? Utterly adorable. LPQ is my favorite breakfast spot & I do love those belgium brownies. They are absolutely delish! I was fortunate to pick up the recipe card they had for it years ago & have been making it ever since. These look amazing – I haven’t had an LPQ brownie for years but they used to be my favourite day-improving treat! Your love of chocolate really comes through in the writing of this piece! Only someone with a deep and abiding love could write so beautifully, so poetically. What vivid imagery, and what a pleasure to read these words! I love the elemental simplicity of this recipe. I’m weary of trashed-up, over-loaded brownie recipes (i.e., salted-caramel-peanut-butter-cup-pretzel-brownies and the like). Recipes like those are like seeing a beautiful girl with too much makeup who ends up looking cheap. What about browning the butter before we start? Would that add too much to this (other than another pan and maybe 5 more minutes)? Mmmm…browed butter…. Deb, your writing is as luscious as these cakelets look. Never stop! Making these today. No choice. Do you think I could substitute oil here for a non-dairy option? These look wonderful. Is a standard-size (1/2 cup) cupcake mold the same as a muffin pan? Do they come out easily from the pan if you don’t use cupcake liners? I have always had problems getting cupcakes out whole. Is there a method? Thanks. I made a batch last night. They are wonderful! Son and husband both agree. Thank you. I made these last night, and they were a HIT! 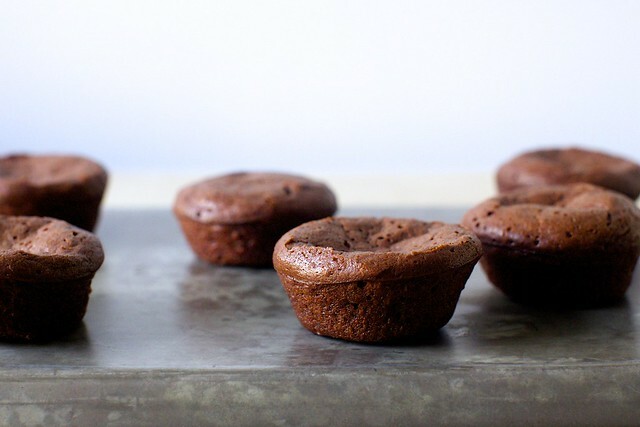 I used a mini muffin tin lined with paper liners, (15 minutes baking time) and to make them look as good as they are, topped them with a bit of piped chocolate whipped cream, they looked beautiful and tasted rich, yet light…. YUM! Thanks for the recipe, my new go-to brownie! I love your writing. And I love brownies. Thank you for both! I love adding extra chocolate. over the years, I thought I was being daring – challenging myself when I make brownies, seeing how much could I add before it’s a problem except so far, I never reached this proportion, so they were never a problem (and mine had more flour obviously). so this recipe inspires me to try your recipe proportion because I love the chocolatey-ness of brownies with too much chocolate. do you definitely need paper cupcake cups? I’m thinking these might require them because they’re just chocolate and butter and sugar and hardly anything to make them whole except the chocolate. I’ll use those tiny bite cups…which means I will eat many of them, because they’re so small and that’s how my mind works. tiny = not fattening at all. Just another quick note to extol your beautiful writing. I agree with every quote written in previous comments that each recipe is such a delight to cozy up to, but I have to say your note about “someone is going to ask me if they can frost these. You may not.” made me yelp with surprise and delight. Your definitive stance and firm opinion make me respect you all the more. Have a wonderful Valentine’s weekend! Loved these when I lived in Los Angeles. Now I can make them at home, here in Dordogne. I have mini tart pans that I never use. They now have a purpose in life. Thank you! Lovely post! Deb, your writing is so amazing. I love your recipes and my son and husband thank you from the bottom of their hearts…but the writing is so superb! Sounds silly, but I’ve read your book many times just to enjoy brilliant prose on the subject of food. I wait for your posts to hit my inbox! This one is a perfect example of what I treasure in your site! And those beautiful children….oh my! Can I assemble and bake half Saturday and the remainder Sunday? I’m out of hiding, having never commented before. After reading your beautiful description, I had to make these right away and they are outstanding. I scrounged together 7 oz. of chocolate from my collection (60% + 72% + unsweetened) and reduced the sugar by 2 T as suggested. Oh my, they are wonderful! And so is your writing. Captivating! Next time I’ll use more spray as my non-stick muffin pan had too much sticking going on. I hope the little bits left in the pan don’t count toward the 315 calories each…. Do you think that I should add an extra 1/2 or whole teaspoon of flour to the mix, or would you suggest leaving the flour quantity as-is? Kate — Could the chocolate have burned/separated a little? 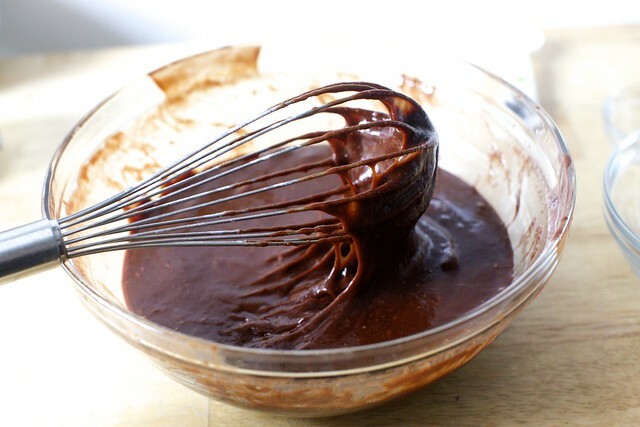 I didn’t go over chocolate melting tips here, but you always want to just melt it until it’s, say, 90% melted and then stir the rest of the way, so there’s no chance of the chocolate bubbling or splitting. Mindy — I ended up leaving out one of my batches for a couple hours and there was no ill-effect (actually, those domed and kept their domes better; but weirdo that I am, I prefer them a little dented on top) so I suspect a day might be fine too. But I haven’t tried it. sharon — That would be just fine. It’s pretty close in weight — the bigger concern, as heavier in salt = saltier — to fine sea salt and I always have that in mind as a swap. Anita — I was wondering the same! Here, I would definitely be curious about brown butter. And you’d have to reduce the sugar a lot. My fear is that if you take too much out, you lose the structure/moisture because sugar provides that too. Marilyn — I had absolutely no trouble getting them out of a nonstick muffin/cupcake tin. Yes, they’re the same, or a standard one is. Regardless of the size, you’re only looking to fill halfway here. If yours are larger or smaller, it won’t matter, only that you adjust the baking time as best as you can and only fill halfway. Recipe looks fine, baby looks scrumptious. She is making me tear up. My littlest will no longer let me nom on the back of her soft fat little neck (nor is it all that fat anymore) and squeals when I pet her tummy… Oh, Deb… enjoy your little curly-head. Wowza, these are rich, rich, rich! I actually like them better the second day, cold with sweetened whip cream and strawberries on it better than warm and plain. Definitely would be a good dessert to serve guests. I love simple recipes like this one! And who does not like brownies?! I love the look of these brownies great for valentine too. My family is literally obsessed with chocolate!! Where you lead, I follow Deb! Yum! Entirely irresistible! I made these last night because my daughter needed to bring a treat to share for a Valentine’s Day party. To make them more kid friendly, I made them with (GASP!) milk chocolate. And they were delicious! Really! They were more buttery caramely than I imagine they would be with bittersweet chocolate. Sweet, to be sure, but still delicious, and nothing that a bunch of walnuts and sprinkling of salt didn’t temper for the grownups. FWIW, I scooped out a bit of the batter and used coconut flour in it because one of the kiddos in the class is gluten free. Those were delicious too. Thank you for sharing, just in time. I’ve had a week. In fact, this am I posted that I plan to medicate with red wine and chocolate tonight, and these look just easy enough to whip up while I start on the wine. I’m fairly sure my chocolate isn’t 70%, but it’ll do. I just made these and wanted to note that I ended up with more than 12 cakelets. I also probably overfilled my cupcake tin a little bit (I used a #16 ice cream scoop so they were a bit more than half full) and I still had enough to do a single tartlet pan (just like the ones you have). I made these tonight and they were great, but can’t help wondering how they would be if I baked them in a square pan and cut them up–like “traditional” brownies. That way the crispy crust lovers can take the corners and the soft, chewy goodness lovers can eat the middles. I think I’m going to try it. Any thoughts on how long to cook them if they were made in an 8″ x 8″ pan? Or any reason you can think of that I shouldn’t try it? I am wondering the same thing… Has anyone tried baking this as a cake, either in an 8×8 square or 9″ round pan? Made these tonight. Delicious! I agree with others that it was the post that drew me in. I normally pass on brownies but there were easy and perfect. Would quinoa flour work in place of the flour? My husband has an issue with almost all grains (corn, rice, wheat, etc). I’m making these for Valentine’s Day..wish me luck! Well. Being that I jumped over here for your I Want Chocolate Cake recipe and was promptly smacked in the face with these little delights, I’m now in a quandary. I think, maybe, I’ll just make both. Done and done. Deb, another fabulous and oh so easy recipe. Can’t wait to make these and serve with a little whipped cream and raspberries as another person suggested. Seriously I’m sure some person who works for a House Beautiful, Martha Stewart should give you a monthly column. Remember when Ina was in H&B every month? Your writing is beautiful, funny down to earth. There are days like today that are not so good and you just make me smile and feel better about life. Your beautiful girl is an angel. Enjoy every minute you can with her time goes by so fast. ps Walgreens carries the chocolate 70-72% required for this recipe I don’t remember brand but it’s a major one. I live in the SW not always a good thing I’m able to pu choclate with a 3 minute ride in car. Happy Valentine’s Day to you and your family. I was concerned the Lindt 70% bar I had might not be rich enough despite all the butter to help it along (husband had run out to the store, and it looked more like a candy bar than chocolate for baking) so I added in about a teaspoon of Nescafe Clasico from the little single serve packet I had left from a Christmas cookie experiment. Took the batter to the next level…smooth, creamy, and yes, rich. Mission accomplished. Now to bake before I can gobble up the contents of the bowl! There’s a Burdicks down the street from the hospital where I delivered both girls. Even though it was June their hot chocolate hit the spot. Someone also brought me chocolates from there as well but Lilli ate them all – it was the only way to keep her in the room. Boy, was she ever annoyed! Incidentally, we made your 40 minute brownies on Monday’s snow day. They hit the spot. I hope you guys are getting some sleep. She’s absolutely scrumptious. But the creativity of the writing on this post was exceptional – this is poetry: When they’re unmolded onto a plate or cooling rack, they sigh and dent a little, as if they had to shift their weight onto one hip after standing too long on too weak a foundation. Their shoulders appear cushiony. They look like humble little shrugs of chocolate and require no adornment, but taste like stars. can i make this ahead of time, like the night before to bring to a party? how would i store them if then? would they taste good? I have a heart-shaped tart pan (approx 10″) that I’d like to use tomorrow. Do you think this batter would work? I’d love to try this recipe AND use that pan for once! These are going to be just heavenly – I can tell. They’re in the oven right now, and the batter is so sublime that you could drink it. Thanks for the recipe! these look perfectly lush – would happily scoff several right now. These were amazing. I was going to make the simple chocolate cake you have on this site for Valentine’s Day, but while looking up the (very long) list of ingredients, I found this. Had to stop by the store for bittersweet chocolate, only found 60%, but had all the other ingredients at home already. Made while family was visiting to rave reviews and the smell of them baking was amazing. The only problem I had was that in using silicone cupcake molds only about 2 of 12 came out easily. The rest had to be scooped out with a spoon. They were all clearly done inside per the toothpick test and we could tell they were done while we inhaled them. Other than using paper cups in the next time, any thoughts about how to avoid this in the future? I will definitely make these again. I just pulled these out of the oven for Valentine’s Day tmrw- and promptly inhaled one (I waited 10 minutes- could not last a second longer!). The texture is awesome, and the bittersweet chocolate is luscious. I used cupcake wrappers in a 12 count muffin pan and they came out perfect. Thanks for such a divine and EASY recipe. Oh my. Elated and doomed as I made a double batch. The last three weeks of gestation may need these every week. I feel like I can justify these as breakfast due to their egg content. So sinful, Deb. Thanks for sharing! Oh my goodness are these good. They might be the best brownies I’ve ever had because, you’re right, the texture is divine. Slightly crunchy top and a light, fluffy, moist interior that is so smoooooooth. Thank you, thank you for these. I’m going to make these tomorrow for dessert after making your short ribs and mashed potatoes. So much better than going out for Valentines Day dinner! I also have a red head that just turned 5. They are impossibly cute and everyone will comment on her beautiful hair. Before you know it, she’ll be going to school, so smother her with kisses while you can! Are these the same Belgian Chocolate Brownies you shared with your penne vodka recipe (or, “you won’t be single for long” pasta)??? Those have been a huge hit every time I’ve made them! Made these last night. They were really delicious and easy to make. As with all your recipes, one can be sure it works and that it will produce a great end product. Thanks for all your wonderful posts; you’re blog is my go to food site when I want to make something new. I cannot stop eating the batter; not sure how much will be left after the 30 minute sit is up. Did anyone skip the 30 minute sit? I couldn’t decide between Lindt or Ghiradelli chocolate bars so I bought both and first am trying this recipe with Lindt. I made these today for my brother’s birthday, they were absolutely perfect (even though I forgot them in the oven for about 10 minutes over the 25 initially planned, and only stirred the sugar in once the chocolate had cooled down as I misread the recipe). The dome fell a little but they were moist and delicious under a crispy crust. I paired them with a scoop of vanilla ice-cream, slices of fresh mango and some whipped cream for a decadent dessert. I had made an extra muffin tin to have leftovers but my guests didn’t leave a single one behind! These are in the oven now, mere minutes (+ half an hour batter sitting time) after putting the baby to bed. Thank you. I love this recipe. Like Kris above, I had way more batter than expected — I filled 12 silicon cupcake cups to 1/2 cm from the top, then filled another 11 mini-cupcake cups! (I measured: 197g chocolate, 195g butter, 185g sugar — were my eggs too large?). Made them for a party yesterday & they turned out delicious, but oddly bubbled from underneath…like all of them somehow had an air bubble in between the paper cupcake lining & the bottom of the muffin. Any idea why? I live in the Netherlands, no clue if the low altitude could have affected the baking (followed your directions pretty exactly, using a muffin tin & the minimum baking time). Also ended up w/15 instead of 12. Unfortunately, I had the same problem that Kate of comment #93 had-butter soup! I measured the ingredients by weight and neither overheated nor seized the chocolate, but I ended up with bubbling, brownie butter soup. I’m sure it will taste fine, but I’m wondering where it went wrong! These were so good! I think they may become my new favorite brownie recipe. I’m withholding final judgement until I see how well they freeze — lots of my baked goods go in the freezer and come out as needed. But ever so good fresh out of the oven. Highly recommend. I made these tonight as a Valentine’s Day treat for our first Valentines day as a married couple–they were perfect! (And served with raspberries and whipped cream on the side). The recipe made 15 “cupcakes” (probably because I went a little heavier on the chocolate). My husband mistook 7 oz of 70% bittersweet chocolate as “70 oz of bittersweet chocolate” but I’m happy to say 60% bittersweet chocolate chips worked lovely in this with a little less sugar as previously mentioned. Thank you thank you Smitten Kitchen for another amazing recipe! I baked these today for our Valentine’s treat. I used semi sweet chocolate and also substituted some cocoa and butter in for chocolate too. I left the sugar at one cup because I have a tendency to like desserts a bit sweeter. I poured the batter into cupcake papers because my cupcake tin is notorious for sticking. There was a bit of butter left in the tin when I removed the cakelets but not any substantial amount. They came out looking much like yours, the same number, the baking time 30 minutes. I had a cup or so of Fenton’s ice cream left in the freezer (caramel crunch) and served that on the side of just warm cakelets. The only thing that disappointed us was that they were not bigger :) But we are soothing ourselves remembering that we have 10 more to go! They are delicious! Something between a brownie, a cake, and a molten cake. So, so good! Thank you for an easy dessert but nice enough for Valentine’s day. @Megan, I accidentally skipped over the 30 minute set up time and they turned out just fine. That being said, it seems like it’s better NOT to skip it because the set up allows the batter to thicken up, which would have made it a lot easier to fill the muffin cups. I will admit to being a bit worried after some of the results others have had, but I made these tonight for Valentine’s Day and they turned out beautifully!! We all loved them. I melted chocolate/butter slowly in the microwave until almost fully melted then stirred till smooth. Added sugar, eggs, vanilla (my own touch), and gluten free flour. Letting it sit for 30 minutes totally changed the batter! These were rich and fudgy and gooey, while still having the crisp top. Yum. Did you publish this recipe 10 years or more ago? The original came from the LA times I believe but I got it form someone’s blog. This is the recipe most requested in my stash. I did make a couple of changes. One was to put cupcake liners in the little tins. The second was to pour the batter into the liners and then let them sit for 30 minutes rather than let the batter sit in the bowl for that time. The biggest change you won’t believe – I made too many one time which is hard to believe anyone can have too many of these. Anyway, we could not figure what to do with them so I froze them. Best serendipity idea yet. The brownies are ambrosia warm from the oven. Frozen – it takes it to a new level. We eat them frozen. It does change the texture but the taste is lifted to an even higher level. It also means that brownies are always on hand when the want for something chocolate attacks. Basically the same recipe but you seperate the eggs and add a bit of raising agent then cook in a water bath. It is amazing. Like cooked chocolate mousse. I strongly encourage ypu to try it. Recipe calls for rice flour but the amount is so little that any substitute will work. Must. Make. Immediately. Also, typos, many, apologies, cracked phone screen, small baby, sleep deprivation, no energy to fix. I made these for desert last night and had a similar problem to Kate’s. The recipe followed to the letter and the batter looked great going into the muffin tins. But no crispy tops and butter pooling under the paper cups and making a drippy mess all over the place. It really made me wonder about using 2 TB shy of 2 full sticks of butter. I also followed the recipe exactly and double checked what I had done. They were delicious and rich but I wanted the crackle experience. I made these for Valentine’s Day. King Arthur sells a bun pan. I used that, spraying the 6 sections with Baker’s Joy so no paper lining was required. I baked them for 20′ in a preheated 325° oven. They were perfect! I bake them only in mini muffin tins (USA brand). the recipe makes exactly 48 tiny cakes – ideal to bring as treats for teachers, co-workers, etc. The baking time is 20 minutes if you want them to be completely underdone inside; 25 minutes for more chewiness and truffle-like interior. At 25 minutes the top does not fall; it stays puffy, crackly and intact. I’ve baked them with and without liners. I prefer without liners for texture and ease of consumption. Also, I wouldn’t bake them in cheap, thin supermarket muffin tins, because it’s too easy to overbake in those. People are always surprised by the texture and richness of these little treats. It’s like a straight shot of pure chocolate. Made these over the weekend. Were great, but they stuck to the bottom of the muffin pan. Maybe I will use cupcake liners next time. Re, buttery bottoms — It sounds to me that people who made these without cupcake liners were happier than those that made it with because the cupcake liners might have wicked away some of the butter, making it look unappetizing? I can definitely see that happening. When they come out of the pan without papers, they’re extremely soft on the bottom, almost damp, hence the shifting/slumping. To be honest, I’d just ignore any lost butter or greasy looking papers (think of it as the croissant-in-a-paper-bag issue; it’s going to happen with anything buttery, i.e. anything worth eating); what matters is that they taste good. I hope they did? The suggestion of papers originates, FWIW, in the originals at LPQ, which always come in them. Is this an older recipe from the site — Yes, I mention this at the very top. It was due for a refresh. This newer version is scaled to make 12 muffin-sized cakes, is now one-bowl and nixes the pastry flour and superfine sugar. susanna — These keep well from the fridge or at room temperature. Mijke — I used a cookie scoop. Annie — NO CAKELETS FOR YOU! Chocolate — I used a mix of Scharffen-Berger and Guittard. Using gluten-free flours — As mentioned in the headnotes, I tested this as gluten-free with cocoa, so not special flour needed. The texture is less perfect; they still taste amazing. Juhi — They’re supposed to be moderately dark chocolaty — definitely rich, not especially bittersweet. What kind of chocolate did you use? Did you use the full amount of sugar? My usual rule for a recipe is to make it once as-is before fiddling, but I didn’t have time for that with this recipe (plus, Deb never leads me astray!). So, I subbed almond flour for the all-purpose in order to make it gluten free. I only got to taste the bits that stuck to the cupcake pan, but by all accounts (esp. from the recipients), these were a huge hit. And the lids did get shiny/crackly with the almond flour, in case that is important to some (would be a show stopper for me, but I can be fussy like that when it comes to baked goods with chocolate). Banana pudding.. Now these. Chocolate heaven! I loved that I was able to get rid of some chocolate from my cupboard and could mix this all in one bowl. Don’t taste the batter.. It’s addicting! I made mine in the cupcake tin with no papers and they came out just fine after I let them cool in the tin. My chocolate loving mom will be the recipient of these babies! I made these last night, they were a hit. I planned a fancy (good china, menus, and a small gift on the plate) dinner for my husband and four kids for valentine’s day and served them as dessert. Absolutely fantastic! I used small cupcake pans (yielded over 40) and gluten-free flour. They were shinny and delicious. Pleased some very picky chocolate fans on Valentine’s Day. So good! Delicious + easy. My silicon heart pan yielded 16, which seemed a little excessive for my family of 3. My friends and colleagues who received brownies these past 2 days have been very appreciative. A keeper of a recipe. Made these for my foodie kids’ Valentine baskets and thus earned myself the coveted Mom of the Year award. I squirreled a few away for myself, too. Thanks for a keeper recipe! Your gorgeous term ‘unconscionable amount of butter’ made me think about the biblically inappropriate amount of butter and chocolate in my brownies! So please find my newly named brownie recipe below for your delectation. Preheat oven to 180°. Line an 8inch (20cm) square cake pan with baking paper. Melt butter and honey in a saucepan over low heat and stir until the butter has melted. Put aside and allow the mixture to cool slightly. Pour into the prepared pan and bake for 30-35mins. Cool completely in pan. When the brownie is cool remove it from the pan and cut with a serrated knife. It will keep for about a week in an airtight container. I cut it into about 36 pieces. Deb – I’m trying to Pin this recipe, and it’s coming up with an error message saying it couldn’t find any pinnable things on this page. Can you help? Also, I’ve been on a Smitten Kitchen run lately – recommending and cooking your recipes like crazy. You never fail me! Thank you for all you do. My kids received a bunch of dark chocolate (not popular at my house) so I melted it down to use in this recipe as a Valentine’s Day dessert. Delightful when partnered with some whipped cream, as Deb suggests. I made these. Fabulous! They have received rave reviews so far. I used unsweetened chocolate and added another tbsp sugar per ounce of chocolate. I didn’t read the earlier version of the recipe, but decided to grind my sugar before adding. It mixed in very quickly that way. Made these and they were killer… They are a close resemblance to my own chocolate chess pie recipe, minus the crust… Didn’t think about doing it before, but it totally works and was divine! ;) Thanks for your always-witty stories that get us to the very end of each recipe. Based on some other comments I want to note that I did not have any issues with wet or greasy liners after baking. I made these for a post-Valentine’s Day dessert last night (real people don’t celebrate on the actual holiday, right?!) They were divine! Paired with fresh raspberries and whipped cream, that left my husband speechless. I made these for Valentines day – served them warm with some ice cream. Absolutely spectacular. I made these this morning, so easy and so good! Thanks Deb! I made these to put into David Leibowitz’s chocolate Babka. Thank goodness that recipe only required 1/2 cup of brownie crumbles because these are OOTW fantastic just as they are! My new go to brownie recipe! The flavor of these was on point but alas, every single one stuck like crazy to the tin and came out in chunks. Paper liners next time, I guess. Ya, these are delicious. I’ve had it bookmarked since you posted, finally made them today. Easy and great! Thought some of your readers might be interested to know that here it is, 6 days after Valentine’s day when I baked these cakelets in cupcake papers. My husband and I have been eating them at the rate of two a day (with a lot of self control! ), and keeping them in the refrigerator. I warm them for about 30 seconds in our microwave and they come out almost as nicely as freshly baked. It has been the highlight of some of the days in this difficult week, to have a warm, absolutely delicious cakelet after dinner. Thank you! I just made them, in silicon muffin and mini muffin molds. 10 muffins & 12 minis. The texture of the tops look very different from your pictures (mines are dark, wrinkly and pokey) but they are still absolutely delicious. The mini ones remind me of the Thomas Keller chocolate bouchons. You had me at “These contain an unconscionable amount of butter and we shouldn’t question it; this isn’t the time for it.” There is never time to question the amount of butter in dessert, just eat less! Mine fell apart coming out of the pan (I’ll try baking a minute or two more next time), but they are so good! My husband has been eating the crumbs by the handful. I look forward to making these! Deb, I won’t use liners, do you recommend running a small spatula along the edges when they’re ready to be released or do you just invert the pan to release them without any other action? Thanks! Update: they freeze well. These babies semi-defrosted are something glorious. Easy and delish. Chopped some fresh strawberries and baked them in a few muffins. Yummy!! Thank you so much for your awesome blog! These look phenomenal. I’m excited to try them with almond meal for a grain free version. Wow! These are amazing, I made them for my boyfriend on valentines day and they were a hit! I added a pinch of this chai spice blend I ordered on etsy and it put it over the top! I made these yesterday without lining the cupcake tin with paper, and I had no problems! :) I added a full 3T flour, but, other than that, followed the recipe exactly. We got about 18 cakelets out of the batter, with the cups filled 3/4. Slightly crispy tops, soft decadent centers.. Great recipe! I simply must tell you that I have made these 3–yes 3!–times since you posted this recipe and I have become an evangelist for the recipe itself. One bowl. ONE. Almost shamefully easy. And such a huge pay-off. These are now known among my friends as “chocolate flavor bombs.” Thank you! So so delicious but, like another baker, i had way more batter and filled almost to the top – resulting in cooking longer — too long i think – and a slightly crumbly texture. Wondering why I had so much batter? Did I fluff it up too much in stirring? There’s 1 left. I anticipate a rumble. I made these this weekend and they were delicious! I followed the recipe exactly, baked them in a standard 12- muffin pan filled half way and ended up with 20 cakelets. No complaints about the “extras”! These delicious brownie cakelets are the perfect little portion! They taste especially great when turned into a mini brownie sundae with a scoop of ice cream, chocolate sauce, and whipped cream. You can also substitute the melted dark chocolate for other types of baking chocolate to change the recipe a little bit. I just made these. I’m not sure what I did wrong but mine are super eggy tasting and spongey in texture. Definitely not what I expected. Kind of a bummer! Just made these with the less sugar and cocoa powder options. They’re scrumptious!! Mine were also spongy and a bit eggy when I ate them still warm but I didn’t notice it once they’d fully cooled. At that point they were fudgy and cakey with a deep chocolate flavour. I discovered when I was about to add the eggs that, despite the fact that we had two cartons of eggs in the fridge, they contained a total of 3 eggs. Luckily, I was baking by weight anyway and just removed 1/4 of the batter and kept going. Super delicious, though mine stuck really badly. I’d probably use papers next time instead of just the nonstick spray, but there will definitely be a next time. Made these for the 2nd time yesterday – first batch was made with 60%ish dark chocolate and the lower amount of sugar – I got 16 out of the batch, but it was a tad too sweet for me. So the second time, I made sure to use the 70%+ chocolate you call for and they are perfect! Both times, I wrapped most of them individually and froze them in a big freezer bag, so I could pull them out one by one to bring with lunch as my mid-afternoon snack. I think these are definitely best at room temperature or cooler. I don’t think you get the full effect fresh out of the oven (this didn’t stop me from eating quite a bit of the batter because sometimes, you just NEED IT NOW) And to the commenters who are raving about them frozen, I agree wholeheartedly! Huge favorite with kids and grandkids (even the one who can only nod vigorously at this point). Last batch, made on a cold rainy Sunday when husband had already made one grocery run already, came up short on butter. Only one stick. So I used 3 ounces of canola oil in addition to the butter. Thought they might not be good, but nooooo. They were excellent. I want to make these for a dinner party, but will be a bit rushed for time. Since there is no raising agents could I make the batter the night before and store in the fridge to be baked up the following night? I wanted to make these yesterday but I didn’t have bittersweet or semisweet chocolate. I did have unsweetened so I took to the comments and found your answer – start with 1-1/4 to 1-1/3 cup sugar; I went with the 1-1/4. I buttered my muffin cups very well and had no issue with sticking. I used my offset spatula to help pop them out of the tin. Also, I did not have any “extra batter” issues. These were amazing and I can’t wait to try one from the freezer! Hey blog post . I learned a lot from the info , Does someone know if my company would be able to obtain a fillable CG 20 37 copy to use ? Seriously delicious. First time I made them, I used a normal muffin tray. But have since used a mini-muffin tray – smaller bites, but so much more of them … a real hit. I made these last night, and cut the sugar to 3/4C because I prefer my (many!) sweets to be a bit less sweet. They were fantastic, but still way too sweet for me. What do you think is the maximum decrease in sugar I can get away with? btw, I used Trader Joe’s Pound Plus, which is 72%. I was thinking keep to 3/4C sugar, and replace maybe 1/4 of the chocolate with unsweetened . . . thoughts? I made these for my boyfriend and he’s obsessed – he even loves them microwaved fresh out of the freezer! They’re completely irresistible. Can you make the batter in advance and bake them later in the day, or is it better to make it right before baking (after the wait time of course)? Has anyone ever made these as a gluten free option? Replace flour with Almond flour or coconut flour? So, did you try yet, Kelly? Or you, Deb? Anyone?? I haven’t yet, but I want to (not for me, I eat everything!). I’m thinking store-bought “gluten-free flour” might do the trick, but I’m always scared to try stuff. There’s so little flour, it should work, right? I made one round with cocoa powder instead of flour, because, you know, gluten. While I would never not eat them, I was sad to find that they lost their shiny lid, which was less crisp too. Do know that the swap works, but if flour isn’t an issue for you, please keep it in there. YES! I swapped out the flour for coconut flour (same amount) and it was perfect! These look great! What would you recommend for baking time and temperature, if using a mini muffin tray? I baked mine approx 13 minutes, maybe a little more since I had the oven open and timer off as I poked them with toothpicks. I just pulled these out of the oven and they look and smell amazing. The tops did fall and that makes me sad, but the batter tasted great so I’m sure these won’t disappoint! I haven’t frozen them but don’t see why you could not. Could the batter stay out a bit longer? Like say 2-3 hours? Or should I refrigerate it and leave it out 30 minutes before baking? It shouldn’t be a big issue, although I haven’t left it that long. Now I finally know why I took that pound of butter out of the freezer. I’ve been whittling it away slowly [I’m someone who looks for something to have with butter] because I hadn’t found anything that jumped out at me. This does. Can’t wait. Too late to start tonight but that butter is coming out of the frig. now. I use organic sugar and for some reason it tends to be heavier so I don’t use grams for sugar anymore even tho I prefer weighing vs. measuring. Removed a heaping T. from recipe. Used 72% chocolate. Used mini muffin pans – 1.25 inch diameter paper cups with ~ 1 rounded regular silverware teaspoon. Baked ~ 13 minutes give or take – did put one tray back in as it was not fully baked. Made 48 – could have made at least another half dozen or so but…I’m a batter eater. Also added a couple of teaspoons of the ‘left over batter’ to a cup of coffee – yummy. The chocolate is intense. Mini-sized snack – pop in your mouth, maybe 2 bites. Would make regular size and serve with ice cream or whipped cream and raspberries as a dessert or just raspberries/sauce . Doesn’t get better than chocolate and raspberries for me. This was a big hit with my neighbors – my official tasters. Got 2 thumbs up with oohs and ahs. I do need to learn to put some time between baking and tasting, not just this but in general. Tasted soo much better to me this evening. Clean up was a breeze with teflon pans and paper inserts. Bringing some in for an early morning meeting. It’s not like there’s a designated time for chocolate. It’s a keeper! Oh, my, Deb — it’s gonna be VERY hard to keep these from being consumed before a party on Sunday! I made them exactly as you instructed and thanks, by the way, for always including the weight. I live at 7,000′ now and find it essential to bake by weight, not volume. So I did these in a mini muffin pan (24) with liners. Couldn’t wait to eat one WARM and it is awesome! I baked them for 12 minutes and had to add 4 minutes more, but no problem. I might be able to get another pan of 24, but no worries if I don’t. This recipe is SO EASY!!! And the issue with a liner? Not an issue here. They did “schlump” beautifully. I am doing something wrong. I made this once and it was the best brownie ever. Immediately my number one brownie. But now I have made it several times where the brownies won’t form but is all crumbles. Any ideas what I’m doing? I don’t think I’m forgetting to include anything and I’ve been baking them for30 min. I had the same thing happen and cannot figure out why! Any insights are much appreciated. I would love to make these a week ahead of time- do they freeze well? I will definetely try these! Quality of the chocolate used is the most important aspect I assume. I love to use original belgium chocolate bars for my own recipes. Im sure it is going to be delicious! Great recipe! Thank you! These are absolutely divine. As other commenters pointed out, they are very similar to the winning hearts and minds cake, but I think it’s better in this form, maybe because the cakelets are taller than a slice of the cake would be? Anyway, two notes: I made them with salted butter instead of adding salt. By looking at the nutrition label, it seemed like the equivalent of 1/2 ts salt. I thought the salt level was perfect. Also, I used a nonstick muffin pan but lined most of the cups with cupcake papers because I was paranoid. While both kinds tasted equally delectable, they looked very different. The ones in papers stood straight up and their tops, while not domed, didn’t collapse. The unlined ones were adorably slouchy, and came out of the pan easily and in one piece. Can’t wait to make them again! These were DELICIOUS. I baked for 22 minutes, and they were perfect. Better the second day. If I was to make these in a mini muffin tin, how long would I bake them for? Deb, what’s your recommendation re storing these end of day 1? Fridge or room temp? How many days? Thanks so much! I think you could do either. If your place is cool-ish, I’d say 2 days at room temperature. A week in the fridge. These are wonderful! I further tweaked it with a spash of vanilla, and a half TB of dutched cocoa (in lieu of the extra tsp of flour). You are an inspiration-as always! Deb, what is your favorite chocolate brand? Thank you! 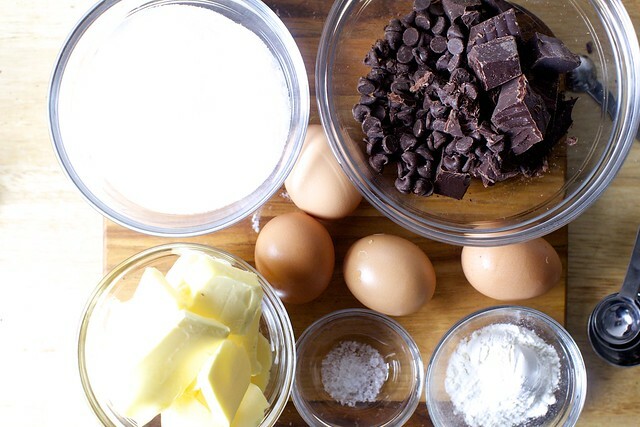 This reminds me of my favorite Baker’s one bowl brownie recipe — minus a couple of ingredients. No other brownie recipe does it for me, but will have to try this because I’m curious how it fares without vanilla. I’ve made a similar recipe for years. The only additional ingredient is cayenne pepper. I use 1 to 1.5 teaspoons. The result is not noticeable at first but after chewing a moment, there’s a nice little latent burst of warmth. Recipe came from chocolatandzucchini.com. Not plugging but do need to give credit. Feel free to omit my comment but do give them a try. They are fantastic. expected to get. Just a thought. I made these tonight and they are so-dang-good. Like crazy good. Thanks for the recipe! My husband made these, and they are now our go-to brownie/chocolate tartlette recipe! So rich, flavorful and fudge-y. He halved the sugar and baked it for 14 minutes in a cupcake pan mold. 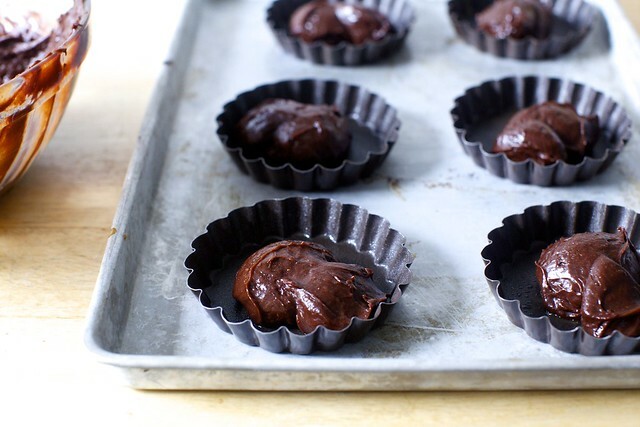 We’ve been recommending this recipe to all of our chocolate-loving friends; love how simple it is, too. These are delicious and are even better the next day! My one problem is that they didn’t get the shiny top like yours did Deb. Both my daughter and I made these and we both had the same issue. Any suggestions or hypothesis as why this might be the case? I did a little internet research and there are some people that say it could be the butter temperature, the whipping, or to use chocolate chips instead? I over-filled the muffin tins a bit so the tops spilled over in cute little flower petal patterns, but I was able to pop them out of the tins in one piece. I don’t have a scale to measure ingredients so I had to eyeball the chocolate and tried to adjust the rest. Clearly I’m not so good at that, as I had enough batter to have made 13 cakelettes. Instead, I tried to top off the 12 I had room for and ended up with the overflow issue. Regardless of that little imperfection, I’ll call this a success. These are so good. Thanks, SK! I served them with blueberries and a dollop of whipped cream (beaten with a dash of sugar and a whiff of vanilla). Delicious. These would be good for a dinner party or for book club — impressive, delightful, yet pretty easy to make. Made this with coconut oil instead of butter (friend with lactose intol) – they turned out beautifully! charmingly puffy, in fact. they looked adorable. this is my go-to! It’s so hard to mess up, one bowl, less than an hour – so many wins. I am wondering if these perfect little things can be transformed into a real cake layers? If so, what would be a suggested filling? Sweetened whipped cream and berries? These cakelets are absolutely wonderful! The recipe says that puffed tops will fall as cakeletes cool down, and it was indeed the case for my first two batches. However, the third “batch” (which made only 4 cakelets) came out the puffiest of all, and the volume never got smaller. Probably, because the batter stayed on the counter much longer than 30 minutes, or maybe because I cooked it longer (I took previous batches out of the oven after 25 minutes because the toothpick was clean, and this time my baby woke up, and I took the cakelets out of the oven at least three minutes after, which is probably 28-30). Anyway, this last four little brownies were the best, and I will certainly try both keeping them on the counter longer, and cooking for couple more minutes after they seem to be done. To make these gluten-free, could coconut flour be substituted for all-purpose? Or are they too different and would your recommendation remain cocoa powder? I want to make this for work this week but one of our assistants is gluten-free and I’d love to make it so she could eat it. Thanks! Ok I checked the other comments AFTER posting; sorry! I see another home baker did the coconut flour switch successfully! I’ll try it! I am also wondering about making the batter ahead a bit for a dinner party, could it sit longer than 30 minutes in order to be popped into the oven just in time for a warm dessert? Or will that mess up the consistency? Thanks! I haven’t tried it but I bet it would be okay. Maybe not for hours and hours, but probably a little longer isn’t a big deal. Is the swap for gf flour 1:1?? Did you try it? Loved the recipe! But wondering if I can use less butter? Like just 1 stick? Thank you! I have made these several times. Thank-you for these delightful cakelet, I am definitely smitten with them. But my question is, when making them in the gluten free variant, do you reduce or omit the chocolate, or simply swap cocoa powder in for flour? I swap cocoa in 1:1 with the flour. However, if you have a favorite gluten-free flour for baking, I see no reason not to use it instead. Hi! I made the original recipe twice, loved the bold chocolate flavor. However, its was way too fluffy, with big “air pockets”, even when I tried to be carefull not to beaten too much. Anyways, how could I get it to a denser texture? I don’t enjoy the fudge/”underbaked” texture. Thank you! Hm, I’m not positive because I don’t find them very fluffy. They’re perhaps fluffier in a deeper pocket pan, i.e. muffin tins? But they collapse a little, and this is where the fudgy texture comes from. Not underbaked, though, they’re not a molten cake (don’t terribly love them either). Hi Deb, how are you? I’ve done this recipe a couple of times before and worked perfectly (they are my fave!). But the last two times something went wrong and they were bubbling during oven time and after they sit they end up crispy like if there where no flour.. or too much sugar.. to you happened to know where it my mistake? Thank you so much for your help! And congrats again on your blog and books! First, thank you. 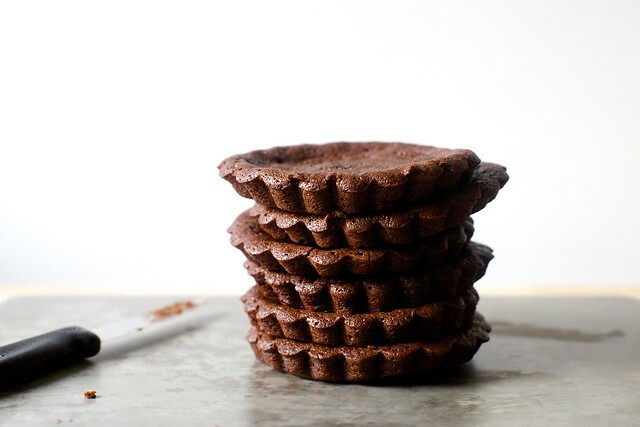 Second, what shape cake pan are you using, muffin cups? Big or small? Hi Deb, sorry my delay (kids…)! I used every time the same cupcake (muffins) pan from Wilson. The thing that make me trigger was that I used all the same ingredients and equipment and the last couple times I baked them they failed on me (or I on them! ). Do you think these are too rich for serving with ice cream and your salted caramel sauce? Baked these in a mini muffin tin, and the recipe yielded 48. Chopped up some strawberries and raspberries and dropped them into each little cup, and they were amazing. I ended up leaving them in the oven for 21 minutes. I also cut the sugar down a bit, to a little less than 3/4 cup. I made this after drooling over the Belgian brownies on display at LPQ. They were perfect both with and without flour, but I was determined to make them dairy-free. I found that substituting the butter with 2/3 c. olive oil works well, and I like adding 1 T regular or Dutched cocoa along with the floor. Grease the pan well and they mostly come out intact. Hi Deb, this is the second recipe of yours that I have tried in a row. I’m so glad I discovered this gem of a recipe. I totally understand what you mean when you say that this recipe does not need added frills like a frosting. Two thumbs up to you for these cakelets! We all are in love with these! I made these tonight. Mistakenly bought unsweetened chocolate instead of bittersweet, so I had to research how to make an equivalent swap (2/3 oz of unsweetened choc. and 2tsp of sugar for every oz of bittersweet). I also included two tsp. of vanilla. Used mini muffin tins- 325 for 20 mins. Perfect. Best brownies I’ve ever made, and the bite-sized portions make the tons of butter and sugar feel less guilty-inducing! Thanks for the recipe. Will DEFINITELY make them again! They taste like the Swedish almost flourless chocolate cake I love. Almost same recipe. Anyway, my cakelets stuck to the muffin pan despite lots of baking spray. I probably should have waited longer than five minutes to take them out? Delicious little thangs though. Also, your writing kills me! Your descriptions of food are actual poetry, metaphors and everything. I’m convinced your writing is a huge reason why everyone loves you. Not all good cooks are also good writers. In summary, you make my life better. I made this with a 1/4 tsp of cinnamon and 1 tsp of piment d’espelette. It was delicious! Such a creamy texture and such a cute dessert. It was a big hit, thanks Deb! (my piment d’espelette is a bit older and so weaker, I tasted the batter as I went. They aren’t spicy but more warming). I made these, but there ended up being way too much butter, but I only used the 7 oz(the 14 tbsp). Maybe 7 tbsp would have been better bc the texture was completely off! I refrigerated it and now they are perfectly fudgy!!! I just made these and I can’t figure out why I didn’t get the shiny tops. They also do seem a bit oily, I didn’t weigh my butter (I cut it using the preprinted guidelines) so I bet I used too much. Would the extra butter ruin the shiny tops? Either way – still absolutely delicious! These look really great but I had a bit of trouble with them! All the butter came out spilling out of the muffin cups and onto my oven causing a bit of burning and smoke. Unfortunately the cakelets were not cooked through either. What do you think I’ve done wrong? I made a batch of these for my co-workers a couple of weeks ago. There was unanimous agreement that they were the best brownies any of them had ever eaten. The chocolate flavor is amazing and the texture is outstanding! delicious! I made 6 or 7 batches of these in mini muffin pans for my son’s wedding dessert buffet – froze (and unfortunately for me and my waistline they are delicious right from the freezer!) them 6 weeks out and they thawed and were perfect – lots of raves about the deep chocolate flavor. Good quality chocolate is a must in this recipe. Do you think you could make these inside cookie cutters on a baking sheet so that they would be heart shaped? Or would they run too much when they got hot? could we use matzah cake meal and make for Passover? Have a batch in the oven now. This recipe is almost exactly Molly Wizenberg’s “Winning Hearts and Minds (wedding) Cake”. She bakes in 8″ round, and I have doubled and baked in 9X13 rectangular to cut into squares. She actually recommends freezing, which is great for building up a large supply over many days. I use Trader Joe’s pound plus chocolate bars–fyi you need 16 squares to equal 7 ounces. Oh, yummy! I cut the recipe in half and baked them in 4 heart tart pans. (If I had another tart pan, I could have possibly got 5 hearts out of the mix …so, I licked the bowl instead…lol!!!) I made the mistake of putting the dish in a water bath and it took them too long to bake. So it took them out for the last 10 minutes and they puffed up and baked nicely. This recipe is totally forgiving!!! I only had chocolate chips on hand and they turned out really well, so I can just imagine using a good quality chocolate would be really decadent! I served these heart tarts with a small scoop of homemade vanilla ice cream I had in my freezer and a strawberry coulis! They were delicious! Merci beaucoup!! After having this recipe saved on my phone for many months, I’m happy to report I finally got around to making these today. My only complaint? Something this rich and decadent shouldn’t be this easy to make! As always, thank you Deb. can you substitute almond flour or coconut flour here? The eggs in the cakeleta curdled in the oven. Why? The eggs curdled in the oven. Why? The batter was so delicious – almost like a pudding – and I’m certain that the final product would’ve been as well, but I ended up cooking these at 350*F (thermostat on the blink and I wasn’t watching in-oven thermometer the whole time). The tops cracked and brownies were a bit dry. They were edible with ice cream, etc. Can’t wait to try again! Sounds wonderful. I will try to make the same cookies! Sometimes I think you read my mind!! I have been searching for this recipe for about 4 years and of course you have it!! The taste and texture is just so phenomenal! My only issue is that the bottoms of these puff inwards. So when I bake them and try to take them out of the wrapper/ramekin, there is a hole in the bottom/center. In order to correct this, should I let the batter stand longer (so batter becomes thicker/heavier), not stand as long (less of a temperature change), add more flour (heavier batter)? I’m trying to solve this with food science, so any help is much appreciated!! Hm, absolutely not a baking science expert here, but I’m not sure that would fix it. This cake shrinks a little as it cools, and I assume that pocket is part of it. Mine were quite crumbly as well, where did I go wrong? How easy is this to half the recipe? These are wonderful and very easy to make. I used 74% chocolate and all the sugar called for and the flavor was great. I baked them in an unlined nonstick muffin tin (with nonstick cooking spray, just in case…). I found these were difficult to remove from the pan when they were warm but they came out fairly easily after cooling for a good half hour. Deb is absolutely right that these do not need frosting of any kind. Deb ~ your writing is just so beautiful and transporting. I am adamantly on a low carb diet. I am making these. Darn you. I left a couple of these on a plate in front of my husband, who promised to try them. In the middle of my shower, he poked his head into the bathroom and told me how deadly they are. Thank you, Deb, for these gems. The house smelled delicious while they were baking. I used a German dark chocolate and they came out very rich. Yummmm. These were incredibly easy to make and delicious — I ended up cooking a 1/4 batch (using a scale) which made 4 in a muffin tin. They were tasty, I put them in for the minimum time and I might suggest checking at the 20 minute mark (especially if you aren’t 100% confident in your apartment-issue oven’s temperature gauge). I think 5 less minutes may have made for an even fudgier consistency (but this may just be personal preference)! Thanks for another great recipe!